I never liked collage. There is something terribly destructive about it, and for a long time all I could see in it was brokenness. It made me uncomfortable and sad. My experience with collage as a child was to rip up beautiful magazine pictures in order to create something mediocre. I was not a fan. One day I realized that art quilting, my first love in art forms, was basically collage. I remember being stunned. At first I argued with myself, I was not destroying things of beauty to create mediocrity, I was redeeming cast off pieces and giving them new life. Surely intent mattered, didn't it? I began to study the history, various artist styles and forms of this medium. I could see it's benefit in trauma healing and in spiritual direction. Slowly, I have grown to appreciate all forms of collage. One of my favorite people is an intriguing collage artist. Jo Reimer agreed to be interviewed here. Michelle: I know you have used several different mediums for expression over your career, what is it that you like about collage? Jo Reimer: You’re right that I’ve used different mediums for expression beginning with the threaded needle and fiber to create clothing and home goods as well as wall hangings. These items included lots of applique and the vast array of surface design techniques. I’ve explored most ways of painting and I draw a lot, now mostly urban sketching. About 20 years ago, while involved in art journaling and book arts, I began using collage on the pages. It grew beyond my pages. I took it larger, finally settling on collage as my primary medium. Collage is simply gluing paper to a surface to build up a composition and tell a story. My work is different from that of most other collage artists in that I work with papers that I’ve painted and textured using techniques I learned way back when I was working in surface design on fabric. M: I love how your work has, in a sense, come full circle in terms of the texturing of fabric and now papers. Would you say you have a visual language? Colors, shapes or symbols that are unique to your work? JR: Yes, I do have a visual language which I realized only recently as I was skimming over the hundreds of images I’ve pinned to my collage and paintings boards on Pinterest. I use geometric shapes to build my works… mostly squares and rectangles, with thick and thin lines, and the occasional circle, spot or dot. Those right angles come naturally to me, probably related to my experiences with patchwork and pattern. Try as I might to go organic, I can’t go there. And color! Everything is colorful although most recently I’ve been loving working with neutrals. They’re so elegant. It’s hard for color to be elegant and I like elegance, and order, and control. It shows. M: Are there particular topics that you tend to revisit often? Why do you think that is? 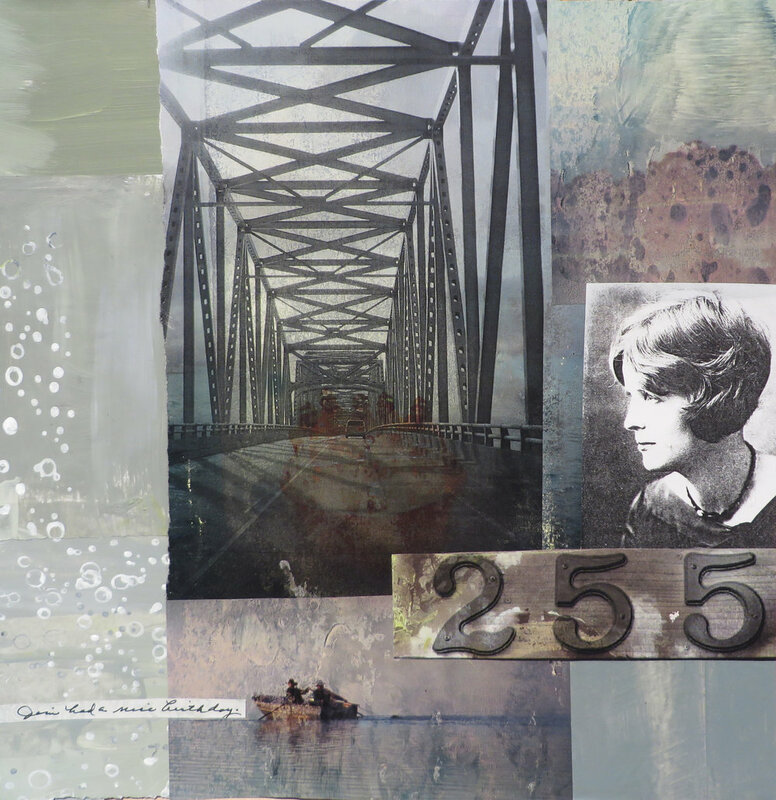 Hometown Girl by Jo Reimer, 12 x 12 collage of painted papers and images on cradled panel. JR: "The woman is my mother. 255 was my phone number when I was a child. The bridge is similar to one that terrified me when I was learning to drive because of the parallel boards on which one had to keep the wheels of the car. My dad loved to fish. After work he’d get one of us kids to go with him and row the boat while he fished. And the words, 'Jim had a nice birthday' refers to my brother. This piece is all about my family of origin." JR: I visit and revisit the idea of home and family. To me it’s obvious why that is… it’s what I know and where my interests and love live. From childhood I’ve drawn floorplans. As a six year old I played among the above-ground roots of a big oak tree, naming the spaces as rooms in a home and populated those rooms with stone “people.” My first paintings in high school home economics class were of a living room and a dining room. I had 6 years of home economics in middle and high school and majored in home economics/clothing/textiles in college. Home is where it’s at for me. M: Isn't it interesting how little things from childhood carry though our entire lives? I know you like order and organizing, but your work is so "loose" and expressive. Can you let us into your process a little bit? JR: Several times during the year I devote a couple of weeks to painting and decorating paper which is then sorted into bins according to color. I also have boxes of many kinds and colors of papers torn from books and magazines or saved from the trash. I call these boxes “compost” because beauty grows from the combining and mixing of these otherwise useless papers. When I come to my work table I stir and sort through my "compost" and choose a few papers that interest me for some reason. Sometimes I come to the table empty minded and let ideas form from interacting with the papers. Other times I have something definite in mind… a memory or an idea or simply a geometric composition that I’ve sketched in my studio journal. I set out my glue pot, a few palette knives, a wet cloth to clean my fingers, and a support… and I begin. I audition the papers which will make the cut and be included in the first layers. I lay the papers in place, repositioning them until the composition is pleasing, and then begin the actual gluing process. It’s messy and fun. The work changes and evolves over hours and days. Sometimes the collage is finished in just a few hours, but usually I return to the work again and again until it’s finished, adding inked lines and paint where needed. M: How is your work impacted by your faith, and do you find the reverse to be true? How does art impact your faith? JR: I’m a Christian who makes art but mostly I don’t make religious art, not the kind of religious art sold in a Christian bookstore. Over several years I’ve made numerous works of art for my church, alter frontals, banners, replica textiles for a model of the original Tabernacle as well as Aaron’s garments. I made a series of collage paintings/ illustrations of the sermons of my pastor, 10 of which are used in the children’s department. I completed 54 of these “Sermon Notes” before the series ended and I consider these works to be the best things I’ve made. Definitely my faith was impacted and was driven by the creating of this body of work; however, I feel that everything I do is an act of worship, simply because of who I am and in whom I believe. I was created to be who I am, to be creative, to draw and paint and glue and make things, so of course my art is impacted by my faith and vice versa. It’s who I am. Isn't she interesting? I've blogged about Jo's work before, you can find that article here. And art blog: joreimer.blogspot.com, The title of her blog, One-A-Day, refers to her commitment to make one piece of art every day. The searchable blog contains lots of information on how she makes art. For information about purchasing a painting contact her at joreimer@comcast.net.